Heat expanded in Liza’s lungs, making it hard to breathe. She tilted her head toward the open passenger window. The warm breeze swept her black hair around her face, and she blinked at her reflection in the sideview mirror as the desert landscape sped by. Her lipstick and eyeliner were perfect. As it should be on her wedding day. She turned to blink at Pete. He was in his favorite pair of jeans and the button-up shirt he wore for interviews. His hair was disheveled as it normally was, and a pair of aviators were perched on the bridge of his nose. He wasn’t exactly the man she’d imagined settling down with when she’d daydreamed about her future, but he’d asked and she was alone. Liza looked down at the layers of white mesh that covered her legs. She’d found a wedding dress at the Spend Thrift before they left town for Vegas. It had a stain on side of the bodice, so she’d thrown on her black leather jacket to cover it. She was sweating like crazy because the car’s air conditioning was broken. But whoever said looking good was easy. He grabbed his lighter and lit the end of his awaiting cigarette. The acrid smoke filled the air before getting swept out the windows. Liza scrunched her nose and sighed. “Only money will get me into the ground floor of Tony’s new business.” He held his cigarette near the open window, and bright ashes were carried into the backseat. Liza grabbed her purse and stepped out of the car. She was about to reach into the back to get her bag when Pete started driving away. 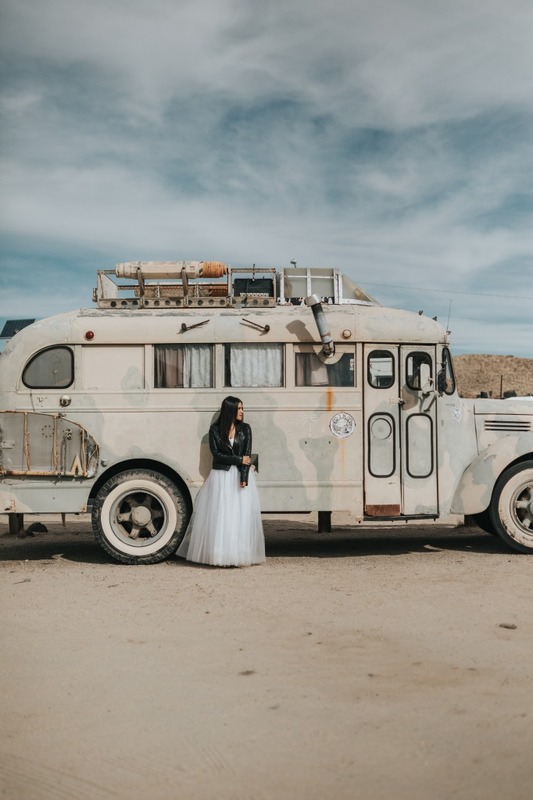 The wind carried off the string of profanities she yelled at him, and within moments, she was standing alone on the desert highway in the hot sun. Tears welled in her eyes, but she quickly wiped them away and collected herself. Her feet started getting warm in her combat boots. At least she hadn’t worn a pair of flats. Liza looked up and down the highway and saw nothing but scrub brush, dirt and rocks. It seemed she would need to start walking, so she continued in the direction Pete had driven. Her boots scuffed against the gravel, sending up a wisp of dust in the wind. Liza’s thoughts were consumed with anger toward Pete until movement caught her eye. Off the side of the highway beyond a dusty slope, a pair of eyes stared at her. She squinted beyond the scrub brush, recognizing the bird’s feathered mohawk. A roadrunner. It began to scurry parallel to the highway before stopping to look back at her. She took a few quick steps to follow, and a smile crept onto her lips. Memories flooded her thoughts of her Grandpa, the man who’d raised her. How he’d sit on the deck of his Arizona home, watching wildlife and hand feeding the wild roadrunners raw meat as they passed through. The smudge of red feathers on the bird’s head was the only burst of color in the beige landscape. She ignored the heat, finding purpose in her steady pace. Her grandpa was with her. She felt him in the wind at her back, pushing her forward. The roadrunner scurried from grassy hillock to sandy dune and stopped to look back at her. Without having noticed, she came upon a turnout. A large tan bus was parked in the sun and light reflected off its dusty windows. Liza rubbed the sweat from her brow. At the thought of water, Liza’s throat closed up, and she nodded, unable to speak. Liza glanced to the dunes, finding the roadrunner’s eyes blinking back at her. Then the wind swept around her in an embrace.